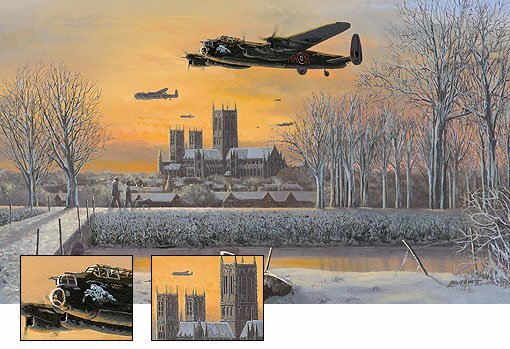 As night falls Lancaster bombers head out over Lincoln Cathedral on yet another dangerous mission over enemy territory. The main aircraft flying over Lincoln Cathedral is the now famous "Phantom of the Ruhr" who went on an amazing 120 operations. Ron Clark was the Pilot on 25 of the 33 he completed, logging 165 operational hours in the aircraft, 147 on night operations., Mr. L. Easby was his Wireless Operator .